Eddie Cantor (1892-1964), born Edward Israel Iskowitz, was an American "illustrated song" performer, comedian, dancer, singer, actor, and songwriter. Familiar to Broadway, radio, movie, and early television audiences, he was regarded almost as a family member by millions because his top-rated radio shows revealed intimate stories and amusing anecdotes about his wife Ida and five daughters. Some of his hits include "Makin' Whoopee", "Ida", "Yes! We Have No Bananas", "If You Knew Susie", "Ma! He's Makin' Eyes at Me", "Baby", "Margie", and "How Ya Gonna Keep 'em Down on the Farm (After They've Seen Paree)?" He also wrote a few songs, including "Merrily We Roll Along", the Merrie Melodies Warner Bros. cartoon theme. In one of the earliest experiments with synchronized sound, Eddie Cantor does his vaudeville act (stand-up comedy and songs) against a plain backdrop. If you'd like to get a taste of what old-time Vaudeville was like, take a look at this fascinating and amusing talkie short. Headliner Eddie Cantor delivers a six-minute routine consisting of several jokes, two songs, and one comic poem, performed before a black backdrop in an empty studio. It's too bad the filmmakers couldn't have captured him in front of a live audience-- as it is, Eddie's jokes are met with eerie silence --but at least George Olsen's terrific dance band was present (off-camera) to provide jaunty jazz accompaniment. 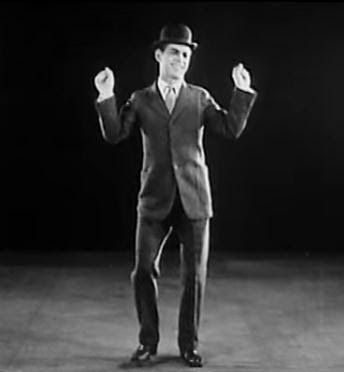 This short captures Cantor's act at the point when his career was really taking off, when he was starring in the Broadway musical comedy "Kid Boots," produced by legendary showman Flo Ziegfeld. The film was made at the midtown Manhattan studio of Lee De Forest, pioneer of the sound-on-film process known as 'Phonofilm.' Between 1922 and 1926 De Forest made dozens of talkie shorts featuring prominent performers such as Cantor, DeWolf Hopper, Weber & Fields, Eubie Blake, etc., films that are invaluable records of the great stage stars of the day. This could you get killed today. I'm glad you all enjoyed the Video I posted to YouTube. Eddie Cantor was Priceless.